Off Lancing beach, Sussex, on the seaward side of Widewater, four Undulate Rays, Raja undulata, were seen in the shallow water (4 metres deep). These rays do not seem to be recorded at bathing depths all that often. Two Thornback Rays, Raja clavata, 300 mm across the wings were seen in very shallow water (3 metres depth ) off Shoreham beach. Also an over friendly Greater Pipefish, Syngnathus acus, which coiled around my friends neck, then swam straight into the camera, then swam up to the surface where its mouth came up out of the water! On two night dives beneath the Palace Pier, Brighton, we found small groups of Squid, Alloteuthis subulata. Their colours changed very quickly from white/transparent to speckled red. Many (20) Little Cuttles, Sepiola atlantica, were seen with a pair were captured on film possibly mating or fighting? 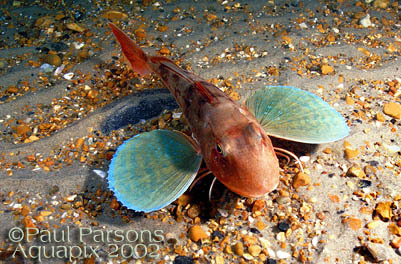 A red Tub Gurnard, Chelidonichthys lucerna, was seen under the Palace Pier. And finally by sliding my hand under its belly, Lesser Weever fish Echiichthys vipera: I counted a good dozen in approximately two square metres, quite worrying as I had my hand on the sand to steady myself whilst photographing Little Cuttles. A Flying Gurnard, Dactylopterus volitans, was caught in a scallop dredge by the F.V. Natalie B, skipper Steven Frank Hatton, out of Newlyn, Cornwall, in 70 metres of water 9.7 miles east of Wolf Rock off the south-west coast of Cornwall. It is only the second specimen of this tropical fish caught in the seas around Britain. The previous fish was also caught off Cornwall. It was described by Robin Turner (Newlyn) as about 30 cm (1 foot) long with large scales and a colour olive green flecked with brown, small ventral mouth, two large spikes pointing down its back and two bony protrusions from its jowls. The pectoral (side) fins were very large. It is not actually a gurnard although it looks very similar: it belongs to the Order Dactylopteriformes, family Dactylopteridae (gurnards are Scorpaeniformes, family Triglidae). A bright orange starfish, Echinaster sepositus, was caught in a bottom gill net near the south-west corner of Guernsey in over 30 metres of water. The fisherman, Ken Robilliard, who caught it and has fished for 25 years says he had never seen this species before. A Bearded Seal, Erignathus barbatus, was found near Leenane (the entrance is Killary harbour), in south County Mayo, on the west coast of Ireland. This is the first record of this Arctic seal for Ireland. beside the bridge in Leenuan, (53° 60'N, 9° 50'W) calmly watching the children go to school. She is 1.5 meters in length, close to 60 kg (best estimate). Between the 4 September and 10 September, 209 dead Common Seals, Phoca vitulina, were reported around the UK bringing the total to 1005 since the beginning of the Phocine Distemper Virus outbreak. 890 of these were from around the coast of England, predominantly from the Norfolk coast with smaller numbers reported from Suffolk, Lincolnshire, Northumbria and the East Riding of Yorkshire. Bottle-nosed Dolphins, Tursiops truncatus, put on the show for visitors, in Fistral Bay, Newquay, Cornwall, with between 8 and 10 dolphins shooting along on the waves with the surfers and leaping out of the water, all this was set in front of a beautiful sunset. About six miles out of Whitby, Yorkshire, we had two sightings of Minke Whale, Balaenoptera acutorostrata, which I believe were two separate individuals. However on the way back, again NNE from port and six miles out between about 17.00 and 17.30, we saw at least five Minke Whales with four in view at one time. We also saw at least twenty small pods of Harbour Porpoises, Phocoena phocoena, with two to five individuals a pod. 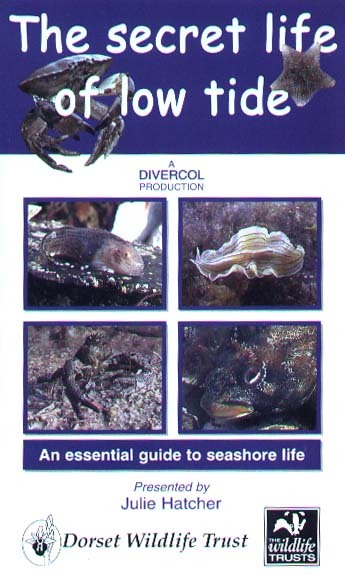 The Marine Conservation Society Annual Conference will be held at the Royal Museum, Edinburgh on Saturday 26th October 2002. 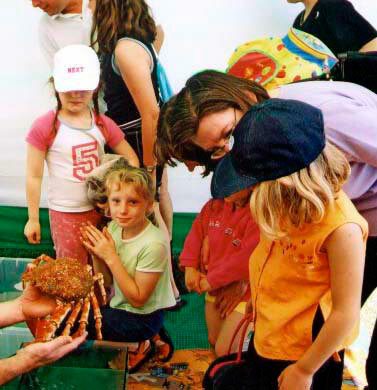 Whether you are a marine life 'expert' or simply interested in finding out more about life in our seas - this conference is for you. Many marine life matters will be discussed, and ideas on protecting our seas put forward. What new species are being grown in fish farms today? How will climate change affect our marine life? How can individuals make a difference to conserving fish stocks? Why do turtles visit UK seas? These questions will be covered in the programme of eminent speakers. Advance booking is essential, and tickets are available from the Marine Conservation Society, 9 Gloucester Road, Ross-on-Wye, HR9 5BU. 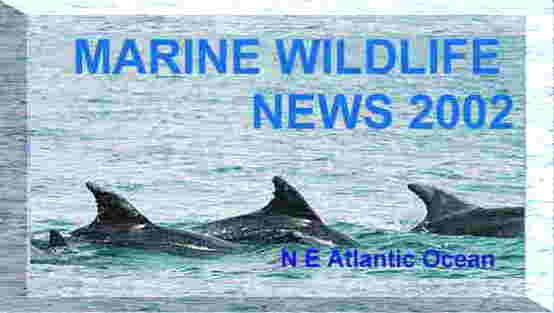 A full programme will be available at http://www.mcsuk.org. The day rate of £35.25 includes refreshments and lunch. 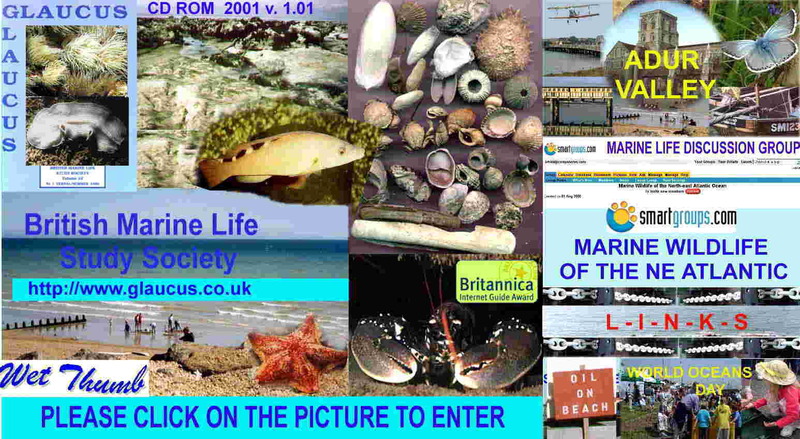 The Marine Conservation Society (MCS) is the UK Charity dedicated to the protection of the marine environment and its wildlife. 20 September- Jose Gonzalez-Vecino (SAMS - UHI). The use of nucleotide-enriched diets for fish broodstock nutrition. 4 October - Cesar Ribero (SOC). Tidal modulation of gravitational circulation in an estuary. 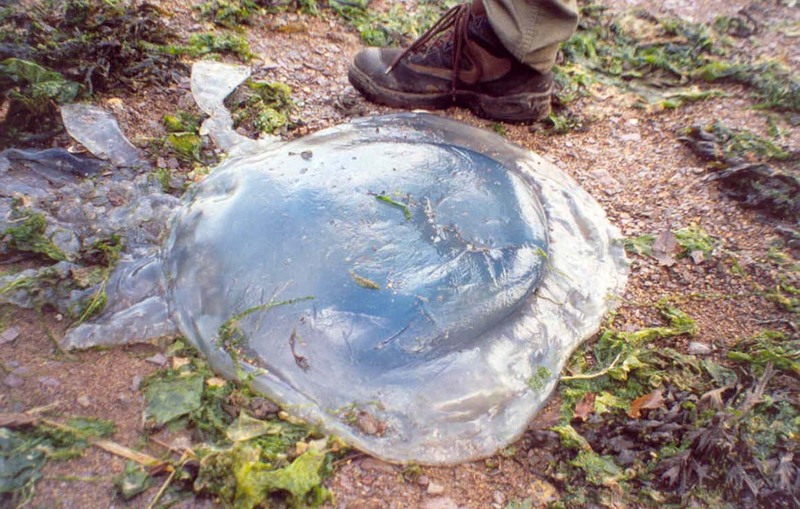 We found four of these big blue jellyfish, Rhizostoma octopus, in August washed up on the shoreline of the River Teign between Newton Abbot and Teignmouth in Devon. My husband has size 9 feet, so you can tell they were pretty big! If you are unable to view this file with all its images through your EMail software, one way around this is to go to your directory for incoming email, where this file should be stored, and open the file Torped76.html in your favourite browser. Microsoft Internet Explorer 4 and above is recommended.